Synopsis: Preservationist Meri Hollis loves her latest project, restoring one of Newport’s forgotten Gilded Age mansions. And with summer approaching, she’ll be able to spend more time with her Gran on the Rhode Island shore. She has a great job, a loving family, and she’s pretty sure her boyfriend is going to propose on her thirtieth birthday. But everything Meri believes about family, happiness, truth, and love is shattered when her family’s darkest secret is exposed. Thirty years before, Meri’s neighbor and friend, Alden Corrigan, took his father’s dinghy out to fish. In a sudden storm, he rushed to help a woman stranded on the breakwater. She was just a girl . . . a very pregnant girl who disappeared soon after they reached safety—But not before she left behind a very special gift. My take: I loved the atmospheric feel to this novel. Very gothic – although not really dark – with the huge, drafty house on the shore; the almost reclusive, handsome man (Alden) who owns the house; and the young woman (Meri) who suddenly needs him more than she ever realized. It’s a tale of honor, responsibility, and what exactly constitutes a family. In the end, family is not determined solely by blood but, more than that, the people who will do anything for you – the people who want to be a part of your life. Shelley Noble included a good amount of detail of Meri’s preservation work in the story. I loved reading about it and could envision the beauty of the Newport mansion her team was restoring. I would have liked the end of the novel fleshed out a bit more than it was but I was nonetheless pleased with the conclusion. 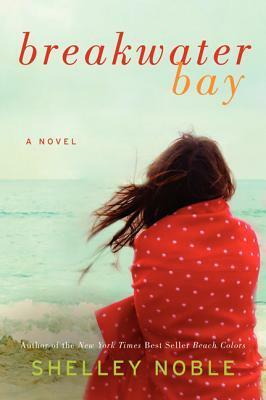 Breakwater Bay is a good summer read – take it to the beach or read it at home and imagine yourself reading at the Rhode Island shore. Shelley Noble is a former professional dancer and choreographer. She most recently worked on the films, Mona Lisa Smile and The Game Plan. She is a member of Sisters in Crime, Mystery Writers of America, and Romance Writers of America. One more thing . . . The publisher sent a finished copy so I decided to share it with one of my US readers.